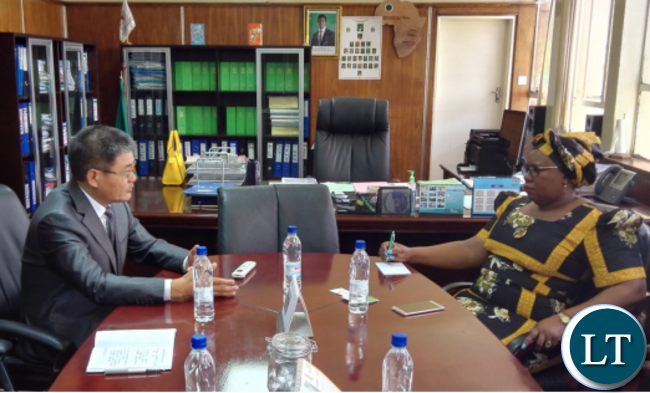 Chinese Ambassador to Zambia Yang Youming last week called on Agriculture Minister Dora Siliya at her office at Mulungushi House. The two sides exchanged views on issues concerning bilateral cooperation in agriculture. Ambassador Yang congratulated Ms. Siliya on her appointment as Minister of Agriculture, and briefed her on the current Chinese agricultural cooperation programs in Zambia. Ambassador Yang said that China stands ready to work along with Zambia on pushing forward bilateral agricultural cooperation. And Ms. Siliya thanked Ambassador Yang’s call after she took office as minister. While appreciating the long-term contribution to Zambia’s agricultural sector made by the Chinese side, Ms. Siliya encouraged and supported more Chinese enterprises to invest in Zambia’s agricultural sector, and hoped to establish closer cooperation relations with China in the future. I just hope this doesn’t involve acquisition of large chunks of our land. I was in Serenje last week on a family visit. I took time to see some places of interest one of which was the Chinese built Tazara Railway facility. Please empower your people how long are you going to undermine your people. Stop depending on foreigners. Stop enslaving the people of Zambia liberate your people. And which Land are you going to give those Chinese? You give Land easily to foreigners but your people get Land with sweat. Wait and see. How much “gifts” did Dollar Syria get from the Chinese? Minister Dora, see to it that the CHINESE Investors be HUMANE in their dealings. Not bringing GOD FORSAKEN PRODUCTS TO ZAMBIA AND FEEDING US FOODS THAT THE CHINESE THEMSELVES CANNOT FEED ON. (CHICKENS,FISH BEEF ) to name a few. ZAMBIA IS A COUNTRY WITH PEOPLE WHO HAVE RED BLOOD FLOWING IN THEIR VEINS ,JUST LIKE YOU CHINESE PEOPLE. We are open to development and progressive projects that will be of benefit to the Zambian people as well as bring you the Chinese people profits. Please Minister Dora, also have the Chinese teach the Zambian people how they do their work. So that in future, the ethnic Zambians can take over. I HAVE A HUGE CHUNK OF LAND AWAITING JOINT VENTURE INVESTMENT IN MANSA. SO LET THE CHINESE GET IN TOUGH WITH ME. Zambians aren’t you see that Chinese are looting from you!!! Singe Dora mumizo, kambwete kateni mane inge kanyikuta! Mwendi kona bweense bwa ncwa ya lifaasi bwasi nyaile Chagwa mwa mukongo bobu alang’anisa kacicimbwelo cwalo!